From our house up on a hill, we look down on an incredibly beautiful ocean view and a small island nestled between the open ocean and the turquoise waters of the sheltered Erakor lagoon. The small island, now a resort, is also called Erakor. The original inhabitants of the island have moved to the mainland. 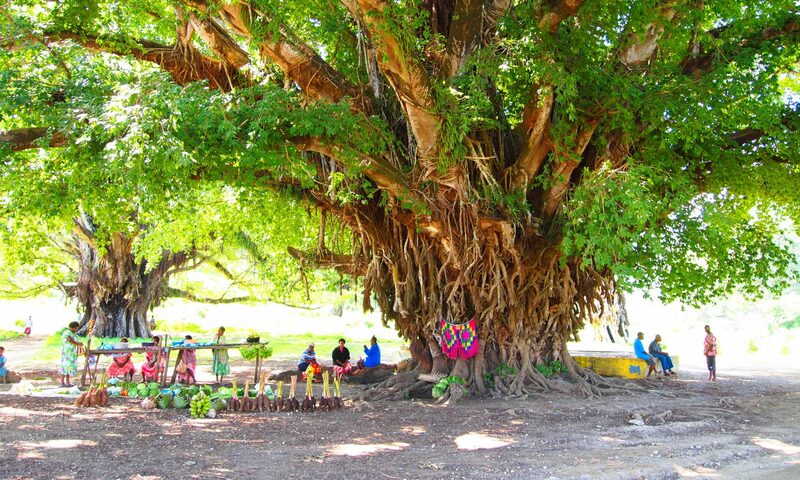 Erakor island is important in the missionary history of Vanuatu as it was an early Presbyterian missionary station. The people of Erakor were first evangelized by four Samoan evangelists, Mose, Sipi, Taavili and Setevano, who arrived on May 1, 1845. Rev. and Mrs. John William Mackenzie of Pictou Co. Nova Scotia, Canada, also came to Vanuatu (then called the New Hebrides) and made Erakor Island their home. The foundations of their house and church are still visible. 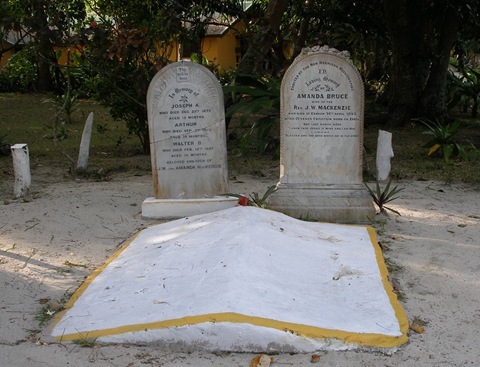 Recently, we went over to Erakor Island on the resort’s ferry to walk around the island and see where the early missionaries are buried. Rev. J. W. and Amanda Mackenzie lost three young children, Joseph aged 13 months died Christmas Day 1875, Arthur aged 19 months died 2 September 1878 and Walter aged 18 months died 12 February 1887. One can only imagine the heartbreak which accompanied each death. In 1893, a ship, the Empreza, came through the islands bringing a deadly viral dysentery which had devastating effects on the local populations. Mrs. Amanda Mackenzie, became ill and died on the 30th of April, 1893. J. W. and four of his children survived these difficult years of illness. 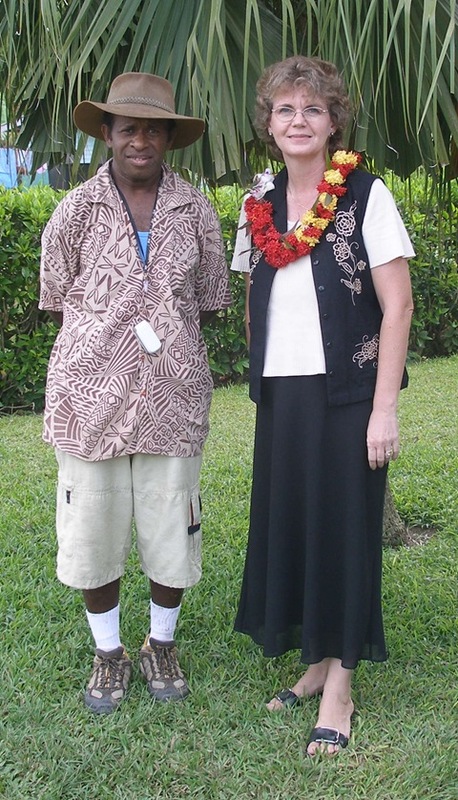 He remained in Vanuatu and married a second time. J. W. Mackenzie was a missionary in Vanuatu from 1872 to 1912 and died after retiring to Australia in 1914. 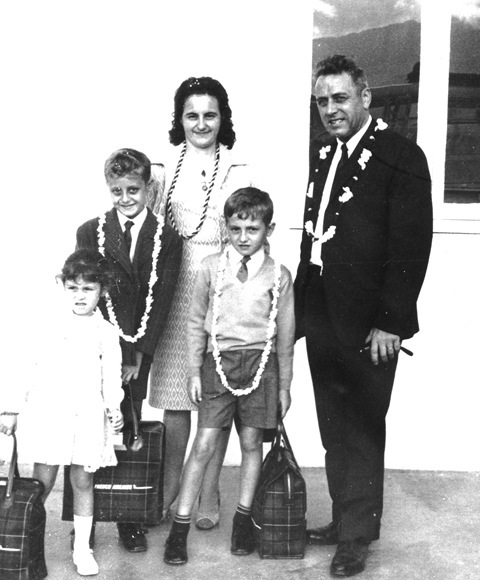 When my father, Ron Killingbeck, arrived in Noumea, New Caledonia in the summer of 1967, he found a young Assemblies of God couple, Jean (John) and Simone Ledru, and their three young children already there. This young man from northern France had stepped out in faith to come to New Caledonia to reestablish a Pentecostal work which had been started many years previously through the witness of J. Rousseau. But by this time only a handful of people remained from the initial work. Jean Ledru and my father joined forces. The Ledru family had been holding services in their living room for several years. Upon my father’s arrival, a storefront building was found on the main road in a neighborhood called Faubourg Blanchot to have public church services. Faith Temple, in Seattle, Washington, gave the funds for the down payment and the building was purchased. The store was cleaned up, painted and our family of three moved into the two back storage rooms while services were held in the large store area. The Ledru family, who had previously lived on the far side of the city of Noumea, moved into a colonial house right down the street from the new storefront church. The church soon became a hub of activity. Early on Sunday morning the French-speaking congregation gathered for their service. My mother played a small electric organ for services and my parents began taking French lessons with a tutor. The Ledru family lived simply and sacrificed greatly for many years as Rev. Ledru worked a job and pastored the now growing French-speaking congregation. Shortly after my parents’ arrival in New Caledonia, it was pointed out to them that there were several thousand islanders from the nearby country of the New Hebrides (colonial name for Vanuatu) working in New Caledonia. The majority of these migrant workers spoke some English along with Bislama and were feeling somewhat isolated in a French-speaking country. My parents quickly met some of them and realized they were just getting into trouble on the weekends with no where to go. My parents immediately started services in simple English at the Faubourg Blanchot church. As they began to reach out to these New Hebridean workers, they learned Bislama, the trade language of Vanuatu. 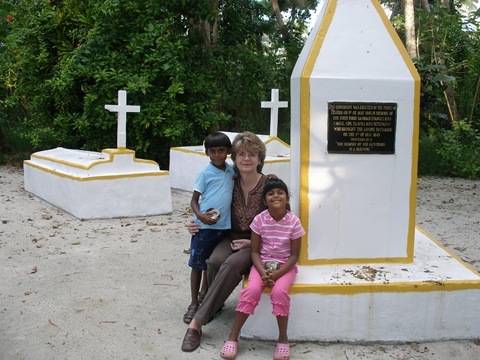 Within a short period of time, the English service became a Bislama service and the congregation grew quickly. 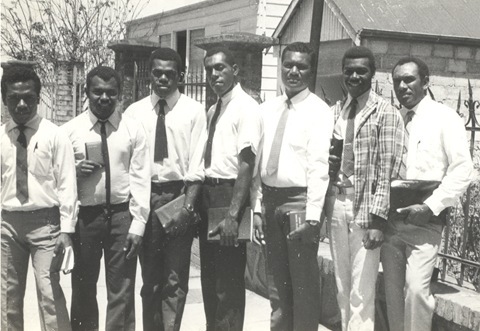 This was truly a divine appointment, because as the Vanuatu workers finished their contracts in New Caledonia and returned home to Vanuatu, the Assemblies of God was started in the country of Vanuatu. 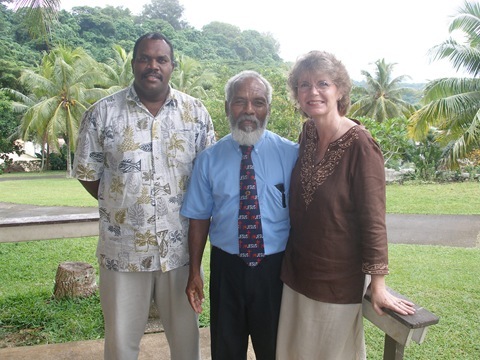 A national pastor from Fiji moved to Port Vila, Vanuatu and started the first AG church in the capitol city. His translator was Loulou Manwo, a young man converted in Noumea and later the first Bible School graduate. My father began visiting former congregants who had returned to Vanuatu, preaching and teaching on several islands and in many villages. In 1972, my family moved to Santo in the northern part of Vanuatu to start a church and reach out to the many northern islands. Except for a few short stays in France, the Ledru family remained in New Caledonia, the church grew, preaching points were opened around the island, other missionaries joined them and national ministers were trained and sent out. Late Friday night, September 12th we were notified that Rev. Jean Ledru had died earlier in the evening of a heart attack and gone to be with the Lord at the age of 80. He leaves a lovely wife, children and grandchildren and also a wonderful legacy of obedience to the Lord and a life spent in leading others to God. Recently at church, I saw some very special friends from the past. 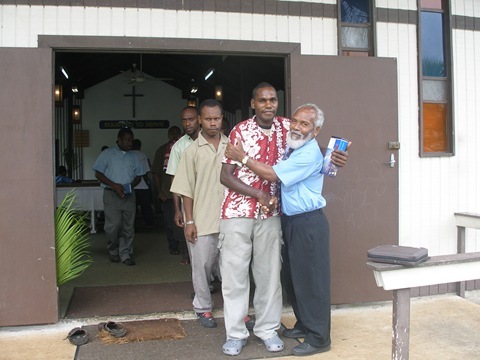 They all attended the church my parents pioneered on the island of Santo, in northern Vanuatu, in the 1970’s. Linette, on the left above, was a little girl in Sunday School back then. The black and white photo to the left shows her with the first Royal Ranger troop in Santo in 1975. 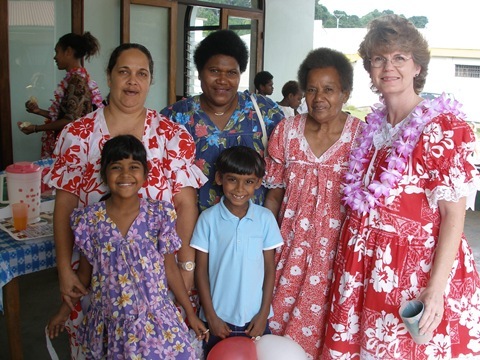 She is now a young grandmother and secretary at the Vanuatu AG national church office here in Port Vila. The second lady from the left in the recent photo, is Madelin. We used to sing together in a girls’ quartet and have not seen each other since our teenage days in Santo. The photo upper right shows us together in 1977 with Christian, another church friend. The lady beside me is also called Madeline and she is the auntie of another childhood friend. It is wonderful to find these dear friends again and especially to find them at church! Pastor Robert Laumai has been at Joy Bible Institute since the first campus buildings were built in 1979. He actually helped to build them and through the years, he and his wife, Edna, have continued to pour themselves into the lives of the young men and women who come to this school. It is no wonder he is fondly called the chief of our little campus village. Pastor Robert Laumai is originally from the island of Futuna, which is among the most southerly islands of Vanuatu. In the late 1960’s he went to New Caledonia to work and met my parents and more importantly, met the Lord. 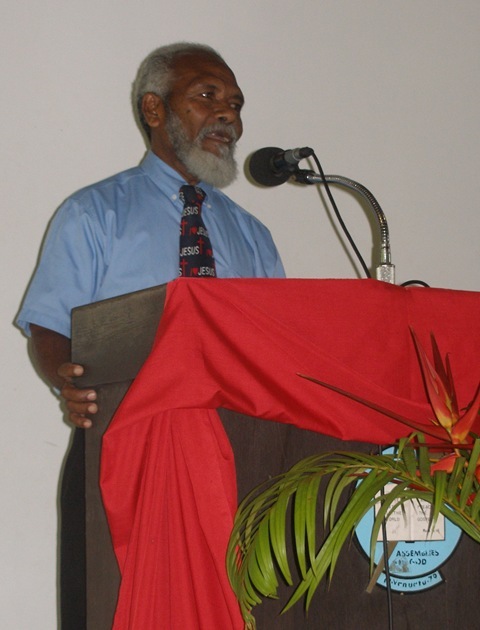 He was among the second group of Vanuatu students who went to Fiji for Bible school training and upon his graduation assisted my parents with their church-planting efforts in Santo, northern Vanuatu. 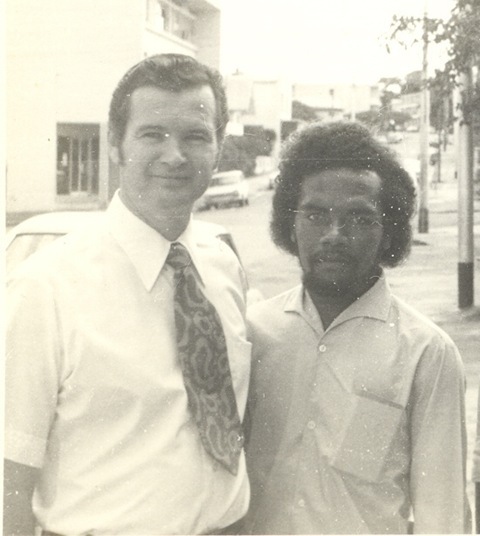 In 1979, when the Vanuatu Bible school was to be built in Port Vila, my father again asked Robert to come and help him. Ever since then he has been involved with the school from teaching to his current position as groundskeeper. What a privilege today to hear Pastor Robert preach in chapel concerning the call of God from 2 Peter 1:3-9 and share from his life experience. He challenged the students to remember God’s call on their lives when other attractive offers come their way. These temporary offers, he said, cannot compare with the life God has planned for them as they follow him. God has promised to “never forsake us nor leave us” and though we may go through difficult times as we serve, He will be with us. You may not know where you will go after graduating from school but God has a place for you to serve and you will learn from every experience. 2 Timothy 2:2, “And the things you have heard me say in the presence of many witnesses, entrust to reliable men who will also be qualified to teach others.” Pastor Robert has been one of those reliable men who has taught and mentored others and we are so glad that he is still serving at Joy Bible Institute. Yesterday after church, I got on a plane and flew 45 minutes north to the island of Espiritu Santo to meet with the media committee involved in planning the upcoming AG General Conference. Going to Santo is always special for me because I spent my teenage years there and my last visit was in 1994. The first person I saw when I came out of the airport arrival was William. William and I were childhood friends and the last time we saw each other was in 1970 in the country of New Caledonia! William’s parents were the first Ni-Vanuatu couple who came and were baptized in the church my parents were pioneering there in the late 1960’s. So we have not seen each other in quite a few years! What a blessing to be together and catch up on family news! 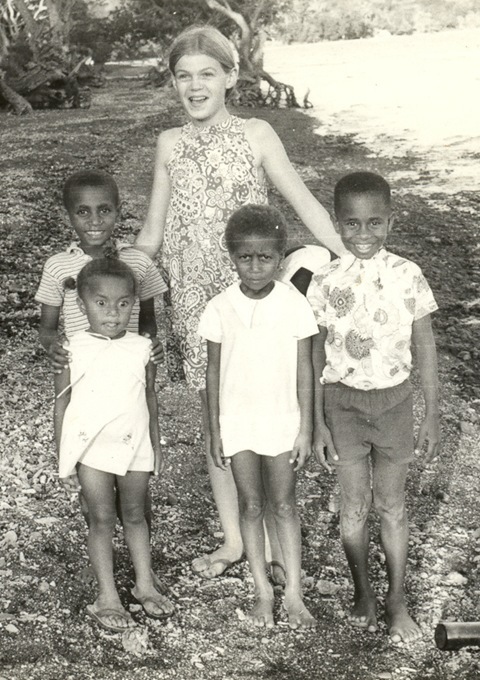 The black and white photo was taken in 1969-1970 in New Caledonia; William is the little boy on my left. His little sister and cousins are also in the photo. The color photo on the right was taken this afternoon of William and myself after the media committee meeting. 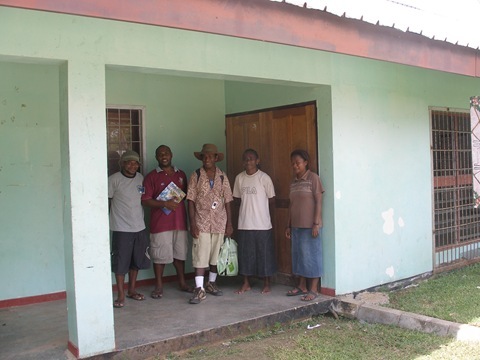 William and a group of committed young people have been reaching out to children and youth in the town of Luganville, Santo. With the assistance of our Santo missionary colleagues, Bryan and Renee Webb, they have rented a building for a new youth center and plan to expand their outreach programs. Please pray that all opposition to this youth center will cease and that they will have the funds to fix up the inside of this building and to buy the instruments and computers for their new program. If you would like to help them, please contact Bryan Webb directly. It was a wonderful day in Santo and tonight I took the last flight home to Port Vila. The last two days we have been getting email messages from many friends who have already received the January 6, 2008 issue of Today’s Pentecostal Evangel about Vanuatu. It includes a small article about ourselves and the ministry of Joy Bible Institute. Thank you so much for your words of encouragement and interest in the work here. We hope to see many of you in Vanuatu helping us to rebuild the JBI campus or up north assisting in the medical or Christian school outreaches! If you cannot come to us, we thank you for your prayers and financial support towards the work here. UPDATE: You can read the above article here, or as a PDF file with photos here.